With easyDCP Creator+ and easyDCP Player as Bundle 1 you can save € 250.00 excl. VAT. 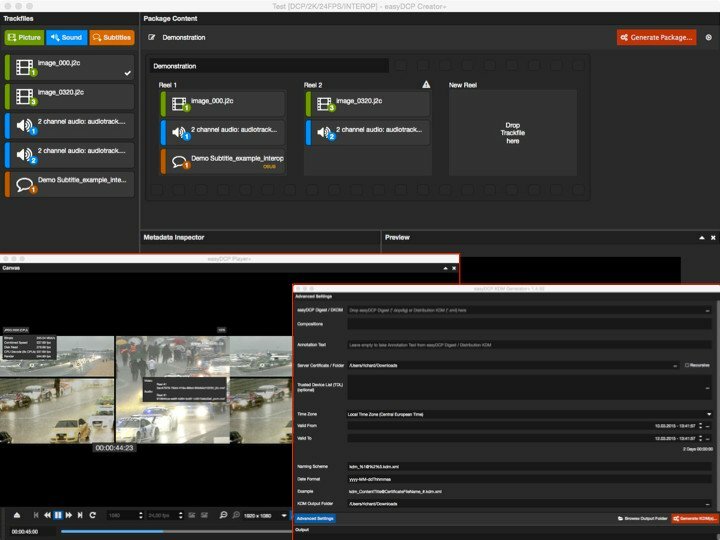 The bundle 1 allows the mastering of 2k/2D/stereoscopic (3D), 4k encrypted and unencrypted Digital Cinema Packages (DCPs) with easyDCP Creator+ also creation of IMPs. Additionally the easyDCP KDM Generator provides generation of SMPTE and INTEROP compliant Key Delivery Messages (KDM). The easyDCP Player handles unencrypted 2k/2D DCPs. If you need to open the encrypted DCPs, 3D, 4K, playback of unencrypted IMF packages or you need to export DCPs/IMF packages in another format we recommend the Bundle 2. For initial tests are available for all programs in the Bundle 1 free trial versions available for download. easyDCP Creator +: It is automatically branded a visible watermark in the DCP/IMF packages. Supplemental for DCP/IMF packages cannot be created. easyDCP KDM Generator: It can KDMs be made valid for a period of 2 days. easyDCP player can 15sec. any DCPs are played. To purchase the full version of the Bundle 1, please use the licensing directly through this website.